I am an extensively trained,Very experienced, British Equine Veterinary Association (B.E.V.A) Qualified Equine Dental Technician (EDT). I am registered with the British Association of Equine Dental Technicians (B.A.E.D.T). I am based in the North Yorkshire area and provide a professional Equine Dental Service for horse owners in the North of England. I specialise in treating horses which have previously been sedated for ROUTINE dental work. 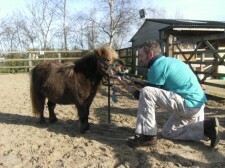 I can prove to you that your horse...or ANY horse does not NEED to be sedated for this type of encounter and that by using effective communication and sound and proper horsemanship ANY horse can cope with... in a totally calm, gentle, understanding and fully cooperative manner.....routine equine dental work. If you would like to save money and have a much more pleasant experience for your horse then contact me. I do not use force....just understanding, body language and effective communication skills...you will be amazed as have been many many owners. If I cant treat your horse for "routine" proceedures without the need for chemical restraint....NOBODY can. Give your horse the most pleasant dental experience he has ever had. The site will provide information about Equine Dentistry, the service I provide, the areas I cover and hopefully clarify some of the confusion and mystery surrounding the current state of the Equine Dentistry profession.